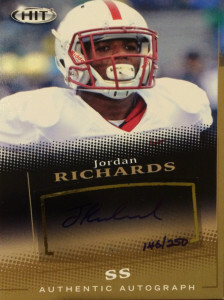 Jordan Richards played for the Stanford Cardinal football team at Safety. He excelled in run support and earned All-Conference honors in 3 seasons while at Stanford. Expected to be a third day choice, Richards was a surprise selection at the end of Round 2 by the New England Patriots. A smart and determined player, Jordan is a strong character guy who is a willing run enforcer despite his 5’11”, 2011 frame. He played for the Patriots on special teams and in sub packages, and displayed that nose for the run, and was pretty decent in underneath zone support. Richards finished 2015 with 2 starts 2 pass deflections, 1 forced fumble, and 14 tackles. He played in 11 games in 2016 contributing a fumble recovery. Considered on the roster bubble for 2017, Jordan impressed during the preseason, and as of the 4th week has played in 3 games starting 1, with 5 tackles, and a forced fumble.